About Nina Radcliff, M. D.
* Your email will be sent immediately to a Media Specialist for expedited management to insure your deadlines are met in a timely manner. Please note the outlet; contact information and any related information. With an outstanding reputation as a medical physician and dedicated communicator to her patients as well as audiences nationwide, Dr. Nina Radcliff is devoted to helping people live healthier lives and gain wise understandings about health and wellness concerns facing our nation, today. She is becoming one of America's leading doctor-reporters contributing to weekly columns and broadcast segments – committed to providing clear, concise and insightful understandings on breaking medical news; developments in medicine; personal health and wellness; as well as the healthcare industry, at large. Her driving passion has always been to touch lives and make a difference through medical practice and wise communications with a balanced framework of understanding in Ethics and Morals; she was greatly influenced at a very young age by her mother – an excellent communicator, dedicated people person and practicing physician. While finishing her degrees in Biomedical Sciences and Ethics and Morals, she was inspired by a professor that understood her mission and pointed to the fact that anesthesiologists obtain the medical expertise and knowledge to address medical encounters of almost every factor. Other doctor-professors echoed a similar message: anesthesiologists are internationally recognized leaders in all areas of medicine for physician-led research in understanding how situations, substances, advancements as well as lifestyles impact all aspects of the human body of children, men and women of all ages and backgrounds. 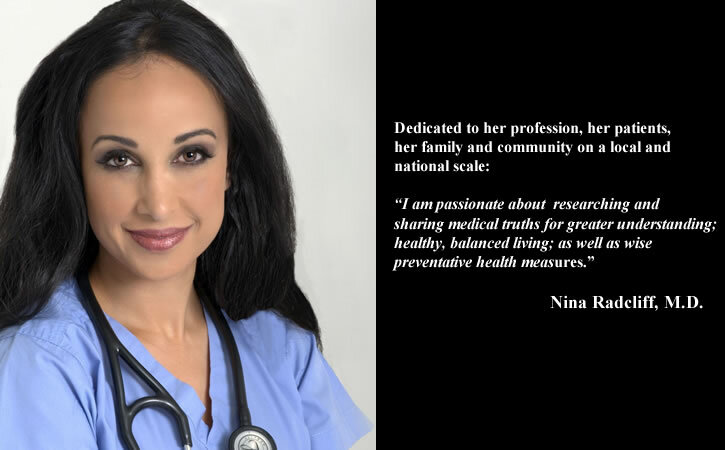 These particular understandings aligned with Dr. Nina's vision to make a difference as a practicing physician patient-by-patient as well as a medical communicator to millions. She went on to complete medical school and her residency at UCLA. Dr. Nina Radcliff is a Board Certified Anesthesiologist and a member of the American Society of Anesthesiologists where she serves on committees for Young Physicians and Communications. Author of more than 200 textbook chapters, research articles, medical opinions and reviews; she is often called upon by national, regional and local media to provide medical expertise on breaking medical news and topics impacting lives, today. In addition, she is a regular medical contributor for newspapers and magazines with her health and wellness column: "Dr. Nina's What You Need to Know." Dr. Nina is a Physician Legislator Ambassador for her state; providing information and insights about issues related to healthcare, primary care shortages, compounding pharmacy safety and patients' rights.